If you’re looking to update your watch collection, why not purchase a solar timepiece? Not only do they tell time with high precision and accuracy, but they are also eco-friendly. Primarily composed of durable stainless steel, these watches are built to last. Not to mention, they are seriously stylish and come in a variety of different styles and colours. From sporty to sophisticated designs, we have compiled the best men’s solar watches that will banish battery replacements. Function and durability meet style with the Casio GW-9400-1CR Solar Watch. 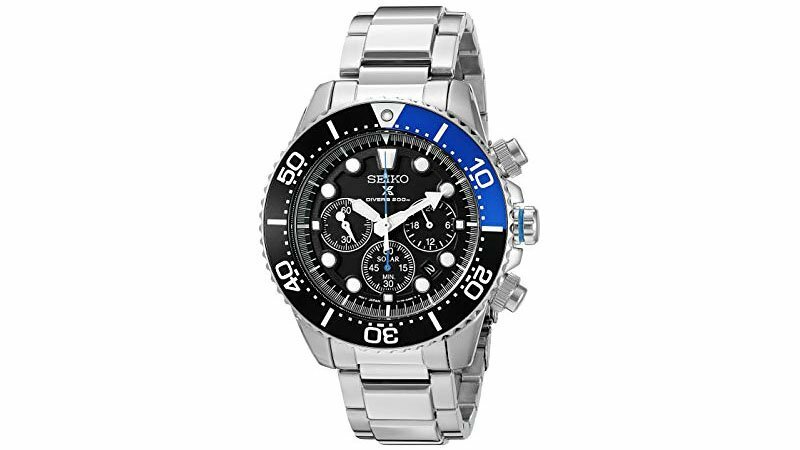 This timepiece is suitable for recreational scuba diving, with water resistance up to 200m. 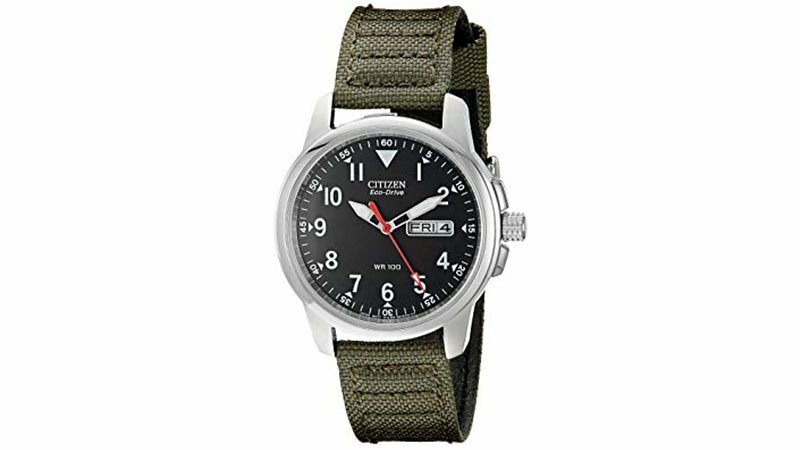 Features include a protective mineral crystal dial window, digital compass, altimeter, barometer, thermometer, time stamp and Mb6 atomic timekeeping. Completing its sporty appearance is a black resin band with a black face, red accents on the dial and a buckle clasp closure. 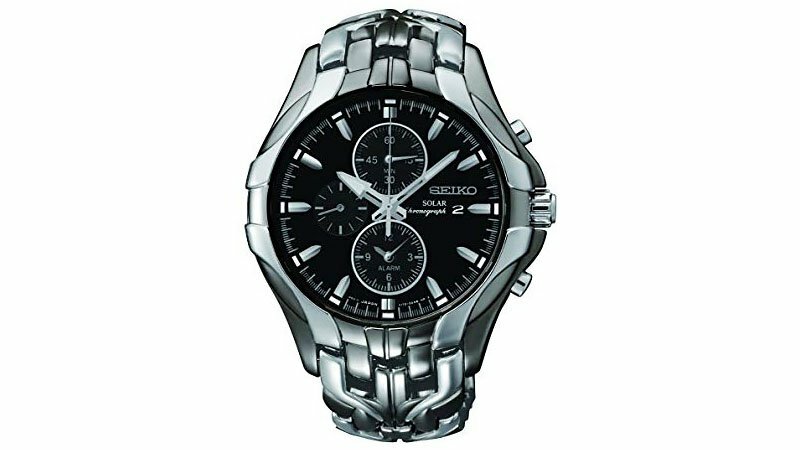 There’s a lot to like about the Seiko Excelsior Solar Chronograph Watch. The two-tone timepiece pairs a multi-chronograph black dial with luminous hands and markers for pinpoint accuracy and easy readability. 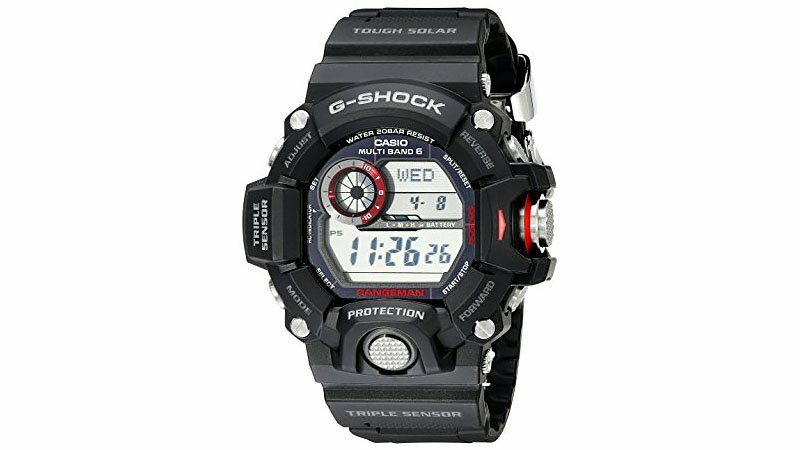 Features include a screw-back case, driving system, alarm settings and solar movement powered by all types of light. A Hardlex dial window protects a 43mm stainless steel case for the ultimate resistance. Other durable features include a sculpted stainless link bracelet and foldover clasp with double push-button safety closure. It’s Japanese quartz movement and water resistance to 100m will stand up to the rigours of swimming and snorkelling. 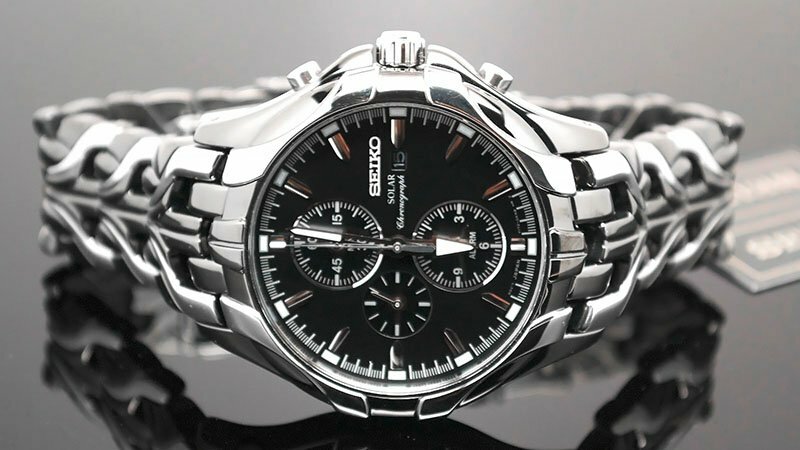 The Seiko SSC017 Prospex Solar Watch merges a practical design with a sleek finish. Built for endurance, the solar-powered timepiece boasts a 43mm stainless steel case with Hardlex dial window and a fold-over clasp and double push-button safety. The solar-power stainless steel bracelet with black dial features luminous hands and markers and three chronograph subdials. With water resistance to 200m, the watch will keep up with professional marine activity and serious surface water sports. Along with being recharged by light, this expertly crafted watch harnesses a Japanese quartz movement and diving bezel function. Take your watch game to new heights with a solar watch that surpasses its competitors in functionality and durability, as well as technological features. 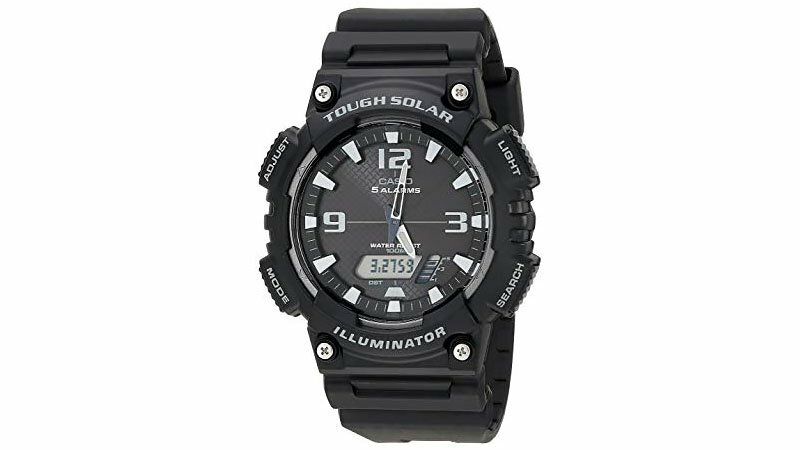 The Casio Solar Sport Watch features a 46mm case, water resistance to 100m and Japanese quartz movement as well as a rugged black dial. Featuring a LED light with afterglow and neo-brite luminous hands and markers, this timepiece will accompany you through both day and night time adventures. The expertly crafted watch also incorporates countdown timers, a calendar function, 12/24 hour formats and world times as well as an approximate battery life of 10 months on full charge, without further exposure to light. 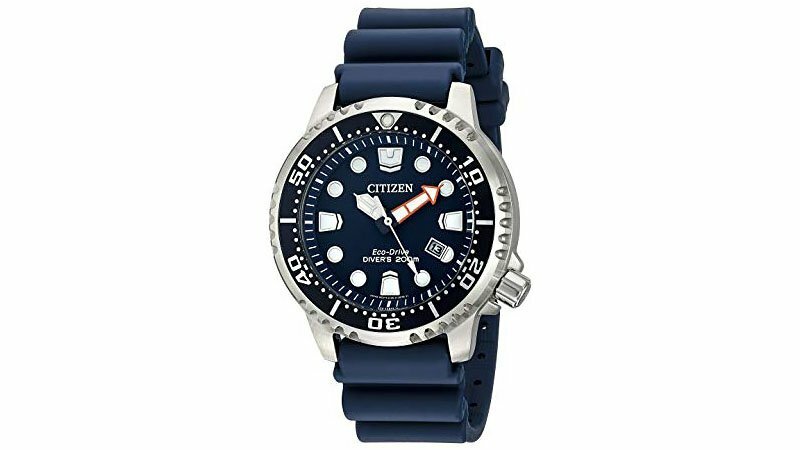 A dark blue polyurethane strap and dial come together to create the Citizen Eco-Drive BN0151-09L Solar Watch. With Eco-Drive technology, the timepiece is powered by light so you’ll never need to open your case back again. A 48mm stainless steel case with mineral dial window and luminous hands and hour markers ensure this watch is the perfect accessory for any activity. The watch harnesses a Japanese quartz movement and water resistance to 200m, making it suitable for swimming, showering and snorkelling. Other notable features include unidirectional bezel, a date window and one-way rotating elapsed time. 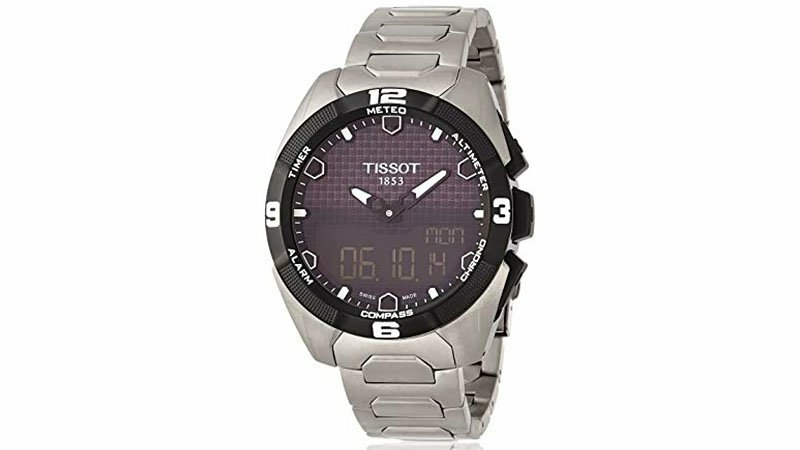 The Tissot T-Touch Solar Watch is the ultimate accessory for the stylish man. Polished, sturdy and incredibly sophisticated, this stunning timepiece features anti-reflective scratch-resistant sapphire crystal, clasp with push-button closure and a 45mm PVD coated titanium case. A black dial is rounded off with a silver titanium band, contributing to the incredible design of this piece, which is as fashionable as it is functional. To ensure an easy-to-read design, Swiss-quartz movement is paired with luminous hands and hour markers. With water resistance to 100m, this durable timepiece is built to withstand even the toughest of conditions. For the rugged outdoorsman, the Citizen Eco-Drive BM8180-03E Solar Watch is the ultimate accessory for any adventure. The stainless steel watch features a round black dial, date function and stitched canvas nylon band. Additional features include a mineral crystal dial window, buckle clasp closure, textured crown and unidirectional bezel function. The watch boasts luminescence, which will enable you to read the time in dark surroundings. With water resistance up to 100m, it is suitable for snorkelling as well as swimming. Finally, it features a Japanese-quartz movement that charges in natural or indoor light. 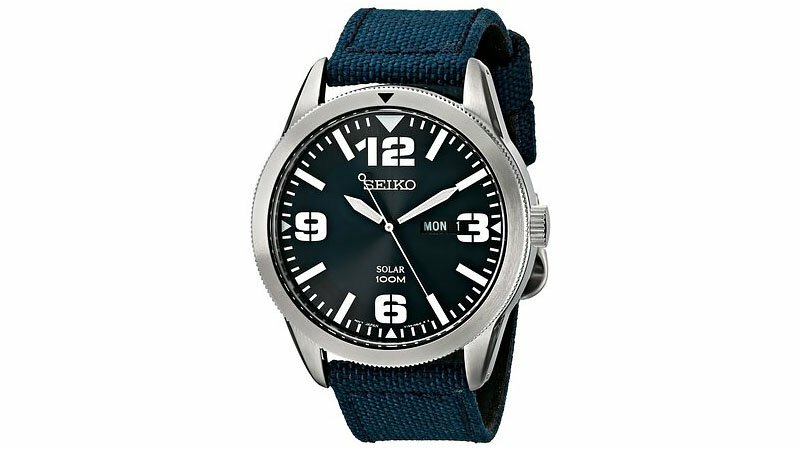 The Seiko Solar Watch is a versatile accessory suitable for day and night wear. A gleaming sunray dial features a coin-edge bezel and day/date window. The timepiece harnesses a Japanese quartz movement with analogue display and is water resistant to 100m. Protected by a 43mm stainless steel case with Hardlex dial window and durable crystal, the watch is certainly built for a long lifespan. Aesthetic features include a nylon band with buckle closure and a blue dial with large luminous hands and markers. Plus, the solar-powered construction of this piece eliminates the need for battery changes. The stylish Armitron AD/1002NVSVBN Solar Watch boasts a classic design. Built for endurance, it harnesses an analogue-quartz movement and 41mm stainless steel case. The watch pairs a matte navy blue dial with silver-tone luminous hands and markers and features a white printed outer minute track and red second sweep hand. 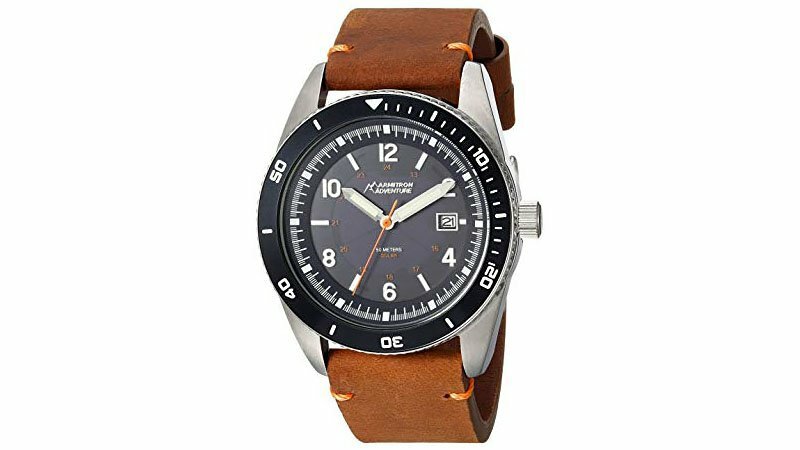 The timeless design combines fashion and practicality with a brown leather strap with buckle closure and coin edge ratchet bezel. The battery is recharged by the built-in solar panel dial, with functionality up to four months when fully charged by light. Additionally, the timepiece is suitable for short periods of recreational swimming with water resistance to 50m. 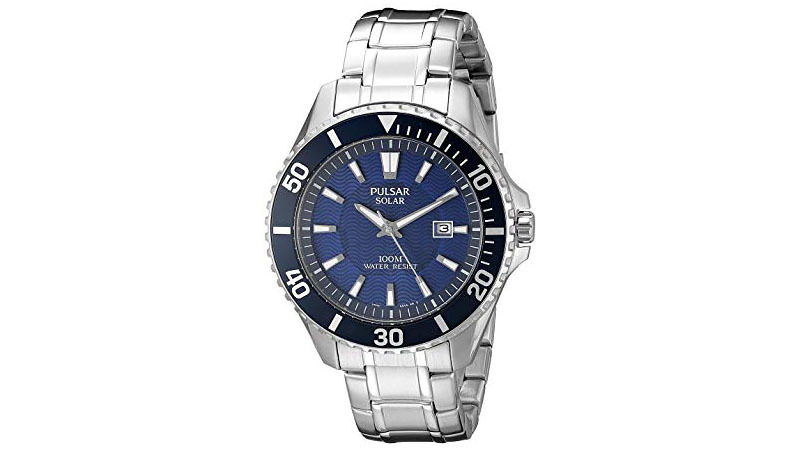 The Pulsar Solar Sport Watch is a sleek and sophisticated timepiece you can wear for workdays or weekend adventures. Powered by all types of light energy, this watch never needs a battery change and has a 4-month power reserve once it’s fully charged. A silvertone blue dial comes together with a Hardlex dial window and stainless steel band for an elegant finish. Plus, the watch harnesses a Japanese-quartz movement. Even more convenient features include luminous hands and markers, push-button-clasp, a date window, stationary bezel function and water-resistant design.